Lens Description: Lens-making is an art - Nikon artisans craft Nikkor optics from the finest materials, taking pride in adding their intellect and technique to bring the world\'s finest lenses to life. They push the leading edge of lens-making in their effort to provide the \"glass\" that makes the world\'s greatest pictures. AF Nikkor lenses work with Nikon SLRs for optimal performance, even the very latest. 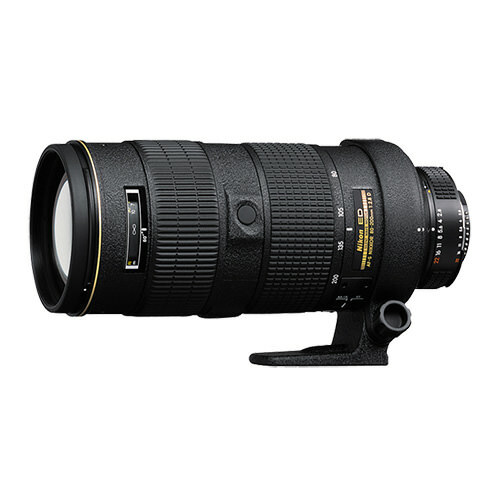 The Nikon 80-200mm f2.8D ED AF is a superb 2.5x telephoto zoom for sports, portraits, and nature photography. With a fast and constant f2.8 maximum aperture through the entire focal range, ED glass elements provide high-resolution and high-contrast image even at maximum aperture. The rotating zoom ring provides precise zoom operation. ED glass: An essential element of Nikkor telephoto lenses. Nikon developed ED (Extra-low Dispersion) glass to enable the production of lenses that offer superior sharpness and color correction by minimizing chromatic aberration. Put simply, chromatic aberration is a type of image and color dispersion that occurs when light rays of varying wavelengths pass through optical glass. In the past, correcting this problem for telephoto lenses required special optical elements that offer anomalous dispersion characteristics - specifically calcium fluoride crystals. However, fluorite easily cracks and is sensitive to temperature changes that can adversely affect focusing by altering the lens\' refractive index. So Nikon designers and engineers put their heads together and came up with ED glass, which offers all the benefits and none of the drawbacks of calcium fluorite-based glass. With this innovation, Nikon developed several types of ED glass suitable for various lenses. They deliver stunning sharpness and contrast even at their largest apertures. In this way, Nikkor\'s ED-series lenses exemplify Nikon\'s preeminence in lens innovation and performance. Nikon Super Integrated Coating ensures exceptional performance. To enhance the performance of its optical lens elements, Nikon employs an exclusive multilayer lens coating that helps reduce ghost and flare to a negligible level. Nikon Super Integrated Coating achieves a number of objectives, including minimized reflection in the wider wavelength range and superior color balance and reproduction. Nikon Super Integrated Coating is especially effective for lenses with a large number of elements, like our Zoom-Nikkors. Also, Nikon\'s multilayer coating process is tailored to the design of each particular lens. The number of coatings applied to each lens element is carefully calculated to match the lens type and glass used, and also to assure the uniform color balance that characterizes Nikkor lenses. This results in lenses that meet much higher standards than the rest of the industry. According to Nikon this lens has a silent wave motor (SWM). I own a copy and the typical screaming noise at the beginning after a longer period not using it tells me it has a SWM. Hello there.May i ask if this lens will work well with my Nikon D300?If yes can i expect any crop factor as D300 is crop sensor camera?Thank you.